Sami Howard's last concussion, captured by a student videographer, looks bad. But it's the sound — something like a dropped bowling ball — that turned the crowd's cheers into a low moan and then near-silence. The five-second video shows the 17-year-old in the No. 11 jersey wrestling for a basketball and then suddenly going down, her blond ponytail whipping around as the back of her head slams the hardwood court with a stomach-churning thud. "You can see me laying there, not moving," says Howard, who grew up in Gresham and attended Columbia Christian's high school in East Portland. "I'm going to have headaches for the rest of my life." The clip of Howard's fourth concussion is undeniably dramatic. But her story of athletic injury, impaired academic performance and eventual recovery is not unusual. In the coming weeks, Pamplin Media Group and InvestigateWest will take a hard look at traumatic brain injuries among young Oregon athletes in an ongoing series: Rattled: Oregon's Concussion Discussion. Students like Howard will share their stories in the context of a deep dive into the concussion data kept by public schools in Oregon, a first-of-its-kind analysis. 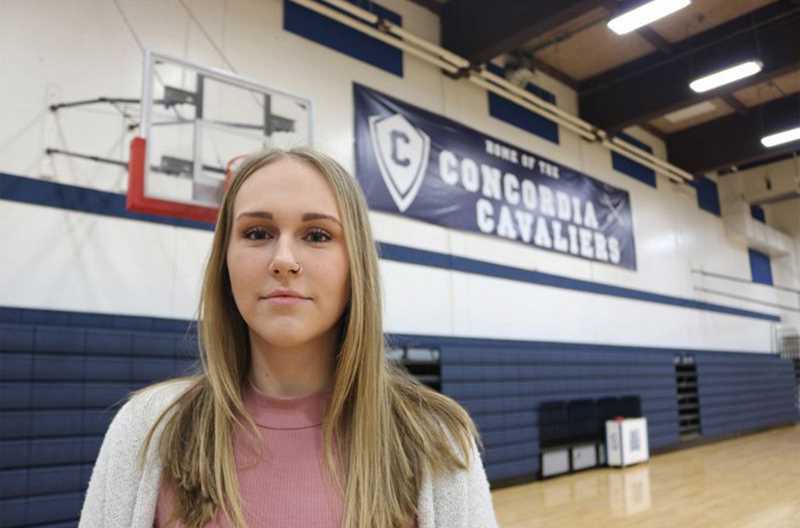 Since Howard was the only senior on her school's basketball team, her classmates at Columbia Christian joked that the final home game of the 2017 season — billed as "Senior Night" — should really be called "Sami Night." The Knights were losing badly that Wednesday, Feb. 8, to the Knappa Loggers, another 2A-ranked varsity team in the Oregon School Activities Association. While Howard describes herself as a very sweet person, she's different on the court. "I'd be diving on the floor. I would bruise after every game," says Howard, who started playing hoops in preschool. "I threw everything into the sport, because I loved it so much." The 6-foot-2-inch player, who'd already committed to playing college ball for George Fox University, expected a few "war wounds" after every game, but the stakes felt especially high that night. So at the start of the second quarter, when she and an opposing player each grabbed for a rebound under the basket, Howard hung on, trying to yank the ball away as the ref signaled a jump ball and whistled the play dead. Both girls went down, Howard falling backward with no way to brace for the impact. Her head slammed onto the court and she briefly lost consciousness as teammates rushed to her side. The Knights ended up losing, 51-14. Howard doesn't remember. She spent the evening in Legacy Emanuel Medical Center getting a CAT scan for what doctors later classified as a severe concussion. The repercussions were huge. Howard dropped her college-level algebra class during her final high school semester while attending medical appointments four times a week. For Sami's mother, Karen Howard, it was the tipping point. "I would tell her in the doctor's office, 'You need to seriously think about stopping,'" recalls the 53-year-old, who herself was a high school athlete. "You could very well become my special-needs child, bottom line, or die from it." Despite the promise made to George Fox, Howard and her parents decided she had to stay sidelined. Permanently. From a perch in the library at Concordia College a year later, Howard isn't selling a sob story. The business major works part time for her school's athletic department as a game-day management aide, setting up concessions and compiling stats for the men's basketball team, just 6 miles from her old high school gym. Ever the competitor, the hardest part, she says, is not being allowed to cheer while sitting on the bench. In many ways, Howard's concussion experience is a story of successful intervention. Head coach John Roady hustled his player off the court after the injury, aware that Howard had suffered a concussion during a basketball game in her sophomore year. Repeat injuries, Roady realized, can be especially severe. From the bleachers, Karen Howard watched as Sami let a water bottle slide from her fingers while sitting on a chair reserved for the players. She knew something was wrong. She took Sami to Legacy Emanuel Medical Center at halftime, and later would make sure her middle child spent the necessary hours with a neurologist and undergoing physical, occupational and speech therapy. Those tests showed Sami's short-term memory had dropped significantly below baseline. Progress was slow, but it happened. Staff at Columbia Christian accommodated Howard's needs. The student center lounge was open if she needed to lie down during the middle of the day, and her mom was ready to pick her up when she couldn't find any relief. Howard describes listening to hours of audio of the TV show "Grey's Anatomy" — the colors and motion made it too difficult to watch the video. Karen Howard remembers the sunglasses and earplugs her daughter needed to block out the world. Even on a good day, Howard would come home from high school, nap for four hours, wake up for dinner, then sleep for another eight. Doctors no longer try to keep patients who suffered concussions awake, because the brain needs rest in order to heal. At the time, Howard was suffering debilitating headaches once or twice a week. She now takes a daily medication for migraines, which can strike once a month or once a week. "It fluctuates," Howard says. "They've just become a part of me: headaches and being forgetful." Her short-term memory is not what it used to be. With less than a month until the end of the school year, Howard is still looking up room numbers and double-checking her schedule. "Little things like that I just don't retain right now," she says. Howard says she's met a lot of college athletes who have suffered concussions. "I'm surprised their parents and their doctors are allowing them to continue," she says. The daughter of two prep basketball players, Howard started participating in school sports as a fourth-grader. She suffered her first concussion the summer before sixth grade during volleyball practice, when she ducked under a net to snag a ball and smacked her head on an equipment cart. Then a minor car accident in 2014 inflicted whiplash and a second concussion during Howard's freshman year. The third concussion came on the basketball court in 2015, during district playoffs. She fell while playing underneath the basket. Karen Howard says that in all three sports concussions, the coaches were good about following the state law and pulling her daughter out of the game and giving her time to heal. Coaches "respected the rule that you have to fully recover," she says. "But you can't wear a helmet." Neither mother nor daughter say they have any regrets. Sami is planning a concentration in sports management. When she finishes school, she'd like to be a coach. Zane Sparling is a Portland Tribune reporter. Rattled: Oregon's Concussion Discussion is a joint project of InvestigateWest, Pamplin Media Group and the Agora Journalism Center, made possible in part by grants from Meyer Memorial Trust and the Center for Cooperative Media. Researcher Mark G. Harmon from the Portland State University Criminology & Criminal Justice Department provided statistical review and analysis. The New York-based Solutions Journalism Network provided training in solutions-based techniques and support to participating journalists. Components of this project, which will include video and audio files, charts and graphs, will be hosted online by both InvestigateWest and the Portland Tribune.